A friend sent me a note a month or so ago, telling me a little girl was born in a city near us. I don’t get notes every time a child is born near us 😳 but this little girl is like my Emily. 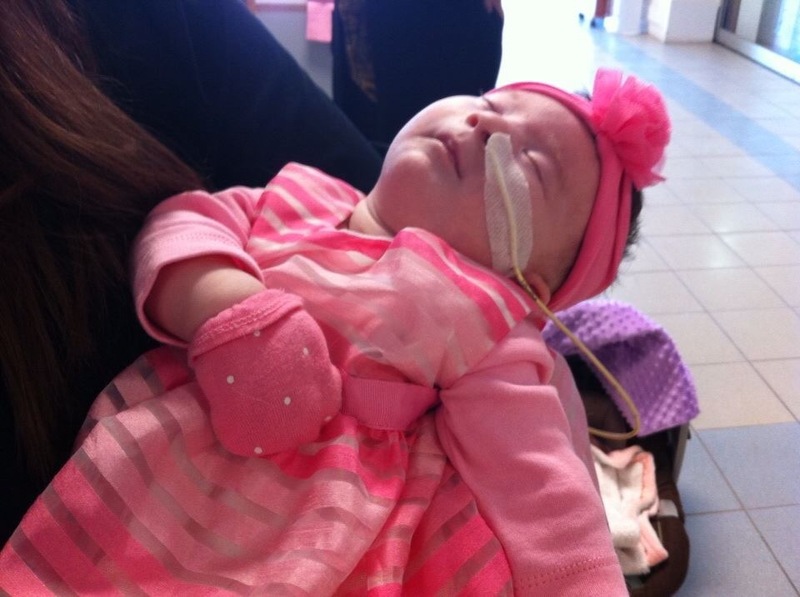 She was diagnosed with Cri du Chat Syndrome within a couple of weeks of being born. I didn’t try to find her, I didn’t research her parents. I figured we would cross path soon enough. We talked for a bit and lucky for us, she told me she would be in our city this weekend. We picked a time and place to meet. When they arrived we said hello, introduced ourselves than we were like old friends… Even the dad’s were chatting. I like seeing babies but I don’t hold them. I think I have held or tried to hold some of my nephews but that’s about it… Unless a friend literally put their baby in my arms, I will just look at the baby, talk with the baby but I don’t hold them. I don’t know what to do with babies. I am awkward with them. I know this sounds rather silly as I am a mom and I have done all the baby stuff with my girl but it’s just not really working for me and other babies. That was until I met this cutie pie! I think I had her in my arms within seconds of introducing ourselves. I didn’t even think about it when her mom asked if I wanted to hold her. It felt natural, that must be what other moms feel when they hold babies. That tiny girl made some little noises, fussed a little and it sent me back 17 years ago. Her mom said she vomited a little earlier which is why they were late and I could relate. She sounded like Emily, she felt like I remember Emily did, she moved a bit in my arms than found a position she liked, she was rubbing her nose on me and that meant the world to me. Emily used to do that. All those little things, they were my “normal”. She reminded me of my Emily, my baby! This entry was posted in awareness, Doctors, Education, Family, friendship, Grateful, Inspiration, Life lesson, parenting, Therapy and tagged cri du chat syndrome, Family, friendship, Life lesson, newborn, normal, Special needs. Bookmark the permalink. We did and it was lovely, just perfect. Did you just research the word “normal” for me? That little girl is so precious. Yup! You have captured “exactly” the right word . And….. You have no doubt helped the new mom of this tiny one to be comfortable with her new normal . She is so sweet. And those little acts of finding a comfortable position and rubbing her nose are lovely. She is extremely sweet and Emily used to do the exact same thing. It was perfect! So cool, she made you.feel comfortable! What a little dolly! Such a tiny little lady but yet, she made me so comfortable. I’m sure you will be a comfort to her mom, having gone through so much yourself with your daughter. Oh wow that is so precious.. a normal that was normal… I get it. Loved the story and she’s beautiful.